Hubbell Trading Post is one of the lesser-known NPS properties in Arizona, located in a rather remote area of the Navajo Reservation in the northeast, though its position along Highway 191, on the tourist route between Petrified Forest and Canyon de Chelly, does ensure a regular trickle of visitors. John Lorenzo Hubbell took over a store here in 1876, in the small settlement of Ganado, a few years after the Navajo returned from their enforced residence in Fort Sumner, New Mexico (the Long Walk), and the post soon became a major center of trade in the newly established reservation. The store is still in operation today, now run as a non-profit organization after being sold to the park service in 1967, by Dorothy Hubbell, daughter-in-law of John Lorenzo. Even though most transactions now involve currency, the old custom of trade still applies, and local Navajo and Hopi craftspeople can exchange goods for others of equal value. 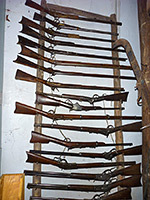 Besides the trading post itself, filled with historic artefacts in addition to the merchandise for sale (which includes jewelry, pottery, rugs, foodstuffs and general supplies), the 160 acre complex also contains the Hubbell Home, complete with its original contents, a two-storey barn, a collection of outbuildings, farmland, a guest hogan (used by researchers and local artists), and a modern visitor center. Just as the store still trades, the other buildings are also in use; crops are grown and animals (horses and chickens) are reared. There is no charge to enter the buildings, except for the Hubbell Home for which guided tours are provided subject to demand, cost $2 per person. 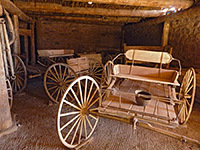 Even with this addition, all can be viewed in not much more than an hour, and while the National Historic Site is far from being a major attraction of Arizona, there are many photogenic scenes, especially in the trading post, the barn and the Hubbell Home. John Lorenzo Hubbell, a distant cousin of the famous astronomer, was born in New Mexico in 1857, and initially found work as a clerk and interpreter in local settlements. By 1876 he had moved to Arizona and taken over management of a small trading post at Ganado, in a valley at the foot of the high Defiance Plateau to the east; there were good opportunities for enterprising traders at this time going to the recently returned Navajo, whose land had suffered during the four years of exile, leaving the tribe in great need of food and equipment. 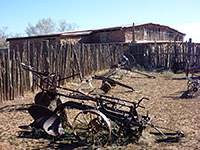 The post was gradually expanded, and Hubbell constructed ranch buildings and a homestead in the 1890s, followed by an irrigation system to enable cultivation of crops in the adjacent fields. John Lorenzo died in 1930 but his two sons and later his daughter-in-law continued to trade, until the post became an NHS in 1965 and was sold two years later. 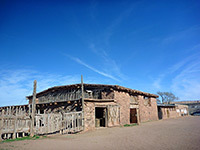 Hubbell Trading Post sits at the edge of the countryside on the western approach to Ganado, beside a small stream (Pueblo Colorado Wash), reached by a short side road which passes the visitor center/bookstore and ends at a parking area in front of the line of buildings. The oldest (the store) is to the north, while those to the south become gradually more recent - the wareroom, barn, blacksmith shop and shed. 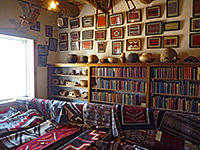 The doorway of the trading post leads to the main shop ('Bullpen'), selling provision and general items, while two side rooms are used for jewelry and rugs, this latter also containing collections of historic items like books, rifles, baskets and paintings. The two-storey barn, once the biggest in north Arizona, is filled with wooden wagons, harnesses and other farm equipment, as are the blacksmith shop next door and the shed to the rear. The thick-walled Hubbell Home is behind the trading post, viewable on ranger-led tours staged every hour if required. 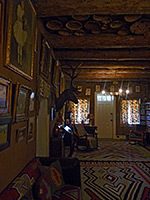 These visit most of the rooms, starting with the main hallway, filled with an exotic mix of artefacts such as baskets (many of which are fixed to the ceiling), family portraits, black and white photographs, books, and elk/bison heads. Bedrooms along each side are roped off but may be viewed through the doorways; one is especially revered because President Theodore Roosevelt slept there on two occasions. The rooms are rather gloomy due to low lighting and curtained windows, necessary to help preserve their historic contents. All items are original except for the rugs on the floor, as the previous coverings were very worn. The tour proceeds through a small courtyard garden, the dining room and kitchen, then outside to the gardens and an exterior bread oven.